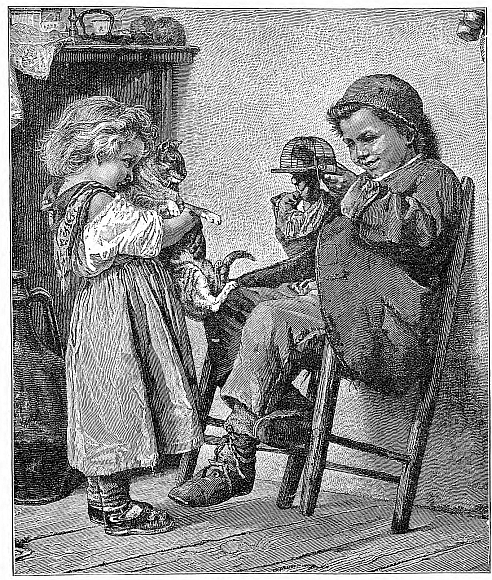 A Little Thief in the Pantry is in the collection A Christmas Hamper: A Volume of Pictures and Stories for Little Folks , published in 1889 by T. Nelson and Sons by various unattributed authors. It's a lesson about perspective, and a little girl's compassion for a mouse who learns the difference between stealing and giving. Most importantly, obey your mother! Greywhiskers twitched his tail with scorn; he was quite sure he knew how to take care of himself, and he didn’t mean to trot meekly after his mother’s tail all his life. So as soon as she had curled herself up for an afternoon nap he stole away, and scampered across the pantry shelves. Ah! here was something particularly good to-day. A large iced cake stood far back upon the shelf, and Greywhiskers licked his lips as he sniffed it. Across the top of the cake there were words written in pink sugar; but as Greywhiskers could not read, he did not know that he was nibbling at little Miss Ethel’s birthday cake. But he did feel a little guilty when he heard his mother calling. Off he ran, and was back in the nest again by the time his mother had finished rubbing her eyes after her nap. She took Greywhiskers up to the pantry then, and when she saw the hole in the cake she seemed a little annoyed. “Some mouse has evidently been here before us,” she said, but of course she never guessed that it was her own little son. The next day the naughty little mouse again popped up to the pantry when his mother was asleep; but at first he could find nothing at all to eat, though there was a most delicious smell of toasted cheese. Presently he found a dear little wooden house, and there hung the cheese, just inside it. In ran Greywhiskers, but, oh! “click” went the little wooden house, and mousie was caught fast in a trap. When the morning came, the cook, who had set the trap, lifted it from the shelf, and then called a pretty little girl to come and see the thief who had eaten her cake. “What are you going to do with him?” asked Ethel. The tears came into the little girl’s pretty blue eyes. “You didn’t know it was stealing, did you, mousie dear?” she said. Cook’s back was turned for a moment, and in that moment tender-hearted little Ethel lifted the lid of the trap, and out popped mousie. Oh! how quickly he ran home to his mother, and how she comforted and petted him until he began to forget his fright; and then she made him promise never to disobey her again, and you may be sure he never did. Add The Little Thief in the Pantry to your own personal library.